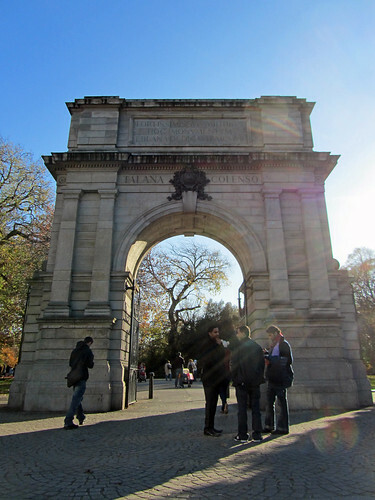 Modelled after the Arch of Titus in Rome, it commemorates the 212 soldiers of the Royal Dublin Fusiliers who were killed fighting for the British in the Boer War (1899–1902). For that reason, the arch was also previously called the Traitors’ Gate by strong nationalists, who believe that Irish should not be fighting a British war but to demand for independent Irish states. Today, history largely forgotten by many, it serves as one of the main meeting points of the city, quite likely before a walk down Grafton Street for a shopping spree. well, it’s nice to make some effort to have my visitors feel welcome, no? ;) and i like learning random useless information like this too, hehehe.